New patent-pending gliding take-up rail moves in sync with the machine’s front-to-back motion. 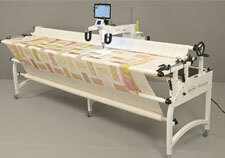 The motor seamlessly moves the fabric rail to the correct location maximizing your quilting area. The frame legs and tables come fully welded, increasing the frame’s strength and durability.